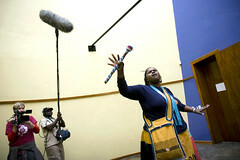 A timeous gathering of local and international poets is set to inspire, provoke and reflect on who we are this coming Africa Day in a free lunchtime celebration at the Cape Town Central Library (Drill Hall) in Darling Street at 12h30-14h30 on Monday, 25 May 2010. Themed “Beyond Borders”, the poets hail from the continent by birth, residence or ancestry. Through performance and discussion, they will challenge and play with stereotypes about Africa and Africans and encourage the audience to consider different perspectives. Recorded poetry soundscapes played (over the PA) in the venue will link to an installation of mirrors conceived by event partner Chimurenga as part of their evolving Chronicles project – The Chronicles project begins its national tour at this collaborative event. 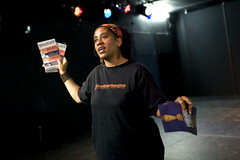 The poets are part of a line-up that is in Cape Town for the Africa Centre’s Badilisha Live on the 21 and 22 May 2010. Artists include two-time USA Individual Champion of the National Poetry Slam (only one other poet holds this accolade) and winner of the World Cup Poetry Slam in France, Anis Mojgani (USA); hot on the block local talent, Blaq Pearl; Canadian born/SA and Swaziland-based, rhythm-driven wordsmith croc E moses; D’ bi Young; an award-winning poet, actor and playwright from Canada (originally Jamaica); and Emmy award-winning, Kwame Dawes from the USA via Ghana and Jamaica. Africa Day is the annual commemoration of the founding of the Organisation of African Unity in 1963, but it has also become a day on which the spotlight is shone on the cultural and social energy that is Africa. Further cause to celebrate this Africa Day is the fact that Badilisha has evolved in an online adventure, Badilisha Radio. Badilisha Radio via its weekly podcasts is the only online anthology of African voices that features poets from both the continent and the African diaspora. Launched with 25 stellar voices. regular updates to this collection will soon see this platform as an invaluable resource for audiences wanting to tap into the heart and mind of contemporary African poetry. For more about Badilisha Live (tickets are R60 available at Computicket), the Africa Day Celebration (free of charge) and Badilisha Radio (online), please visit www.badilishapoetry.com or phone the Africa Centre on 021 422 0468. Follow us on Facebook at Badilisha Poetry X-Change and on Twitter at badilishapoetry. Badilisha Live will be showcasing the multiplicity of poetic expression over two nights of performances, 21st and 22nd May at Cape Town City Hall, as well as an Africa Day Celebration on 25th May at the Cape Town Central Library. To win tickets to Badilisha Live, enter our Twitter competition! We are extremely excited to welcome Anis Mojgani, Blaq Pearl, croc E moses, D’bi Young and Kwame Dawes as our poetic guests for these events. From 18th-22nd May, leading up to these performances, these five poets will be conducting a programme of master classes under the theme X-Cavate, school visits and public discussions aimed at providing a space for reflecting on the poetic art form. On both the nights of 21 and 22 May, at the Cape Town City Hall, all the Badilisha poets will perform across a series of four sets. 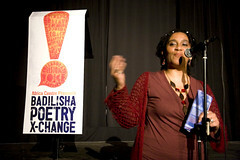 The Africa Centre’s Badilisha Poetry X-Change is back and pleased to announce its Live line-up. On Friday 21st and Saturday 22nd May 2010, a stellar ensemble of five talented local and international poets will gather at the Cape Town City Hall to bring a wave of word and sound to a new Cape Town winter. The line-up of acclaimed artists include two-time USA Individual Champion of the National Poetry Slam (only one other poet holds this accolade) and winner of the World Cup Poetry Slam in France, Anis Mojgani (USA); Canadian born/SA and Swaziland-based, rhythm-driven wordsmith croc E moses; hot on the block local talent, Blaq Pearl; D’bi Young, an award-winning poet, actor and playwright from Canada (originally Jamaica); and Emmy award-winning and prolific poet, Kwame Dawes from the USA via Ghana and Jamaica. As the poetry genre continues to garner increased popularity as an art form, a cultural heat gauge and a subversive tool for social activism, Badilisha remains a ground-breaking platform for poets to engage with both audiences and each other. In the run-up to the performances, the X-Change portion of the Badilisha project unfolds through weekday showcases, readings, screenings and open discussions. A critical component the programme is the X-Cavate series of master classes for aspiring and emergent poets. 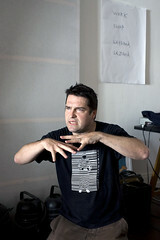 The X-Change sessions seek to open up dialogue between poets, to debate the genre and to share the creative process. Badilisha Live will also be celebrating Africa Day at the Cape Town Library on May 25th. This will feature the Badilisha guest poets and the local participants from the master classes in a lunchtime feast of words and sound. Entrance to this event is free. 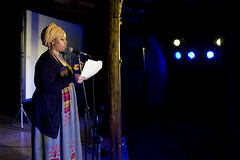 Curated by poets Malika Ndlovu and Bandile Gumbi, Badilisha has launched its ongoing poetry platform; Badilisha Radio. This aurally and visually exciting website is the only international platform for poets from across Africa and is Diaspora in the world. The website has begun its journey with a collection of 25 podcasts of inspiring poets from around the globe. Launching in May, to coincide with the Live event, Badilisha Radio will grow to include an increasingly vital and diverse collection of poetry, uniquely representative of the continent, yet also sound boarding the global poetry community. The site has a discussion and networking forum as well. Tickets for Badilisha Live are available through Computicket (R60 – bookings are open). 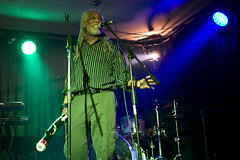 For regular updates on both the Live and Radio aspects of the Badilisha project, visit www.badilishapoetry.com or phone 021 422 0468. 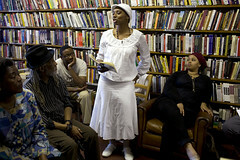 Follow us on Facebook at Badilisha Poetry XChange and on Twitter at @badilishapoetry. INFECTING THE CITY (ITC) the Spier Public Arts Festival hits the streets of Cape Town for its third year from the 13th-20th February. Get out of your comfort zone and engage with exciting large-scale site-specific performance art pieces, choreographic works, installations and low-key interventions. Intriguing participating artists come from South Africa, Zimbabwe, China, the UK, the USA, Greece, Germany, Australia and the Netherlands. A wealth of diversity, viewpoints and talent. ITC 2010 is themed ‘Human Rite’, asking artists to refigure the public spaces of the inner city as arenas in which we confront some of our demons and attempt to put them to rest. To seek out silent memories and invisible stories and celebrate them. To look for what needs to be righted, and ’rited’. Witness the new creative voice of 21st century urban Africa. 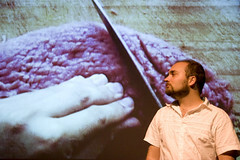 The full programme is available on www.infectingthecity.com. Share your views on the facebook page. Spread the infection, forward this email on to your networks. For further information please contact Felicia Pattison-Bacon on 021 422 0468 or email feliciapb@africacentre.net. 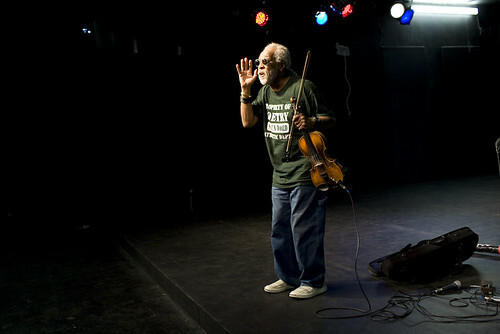 Photographer Cecile Mella attended the second installment of the Africa Centre’s Badilisha! 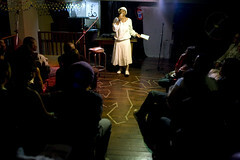 Poetry X-Change last month. Here are some of her snaps from the goings on. All photography copyright Cecile Mella. Presented by Africa Centre, the year-round Badilisha Poetry X-Change 2009 calendar closes 2009 with a weekend of evening poetry at Spier Estate, Stellenbosch on the 27th and 28th November 2009. Using Spier’s beautiful and intimate riverside Bomas, the November Badilisha Poetry X-Change sees local and international poets weave their words into the night. The next installment of the Badlisha! Poetry X-Change is coming up! Head out to Spier Estate this 27 and 28 Nov and let Dorthea Smartt, Warsan Shire, Ngoma Hill and the African Noise Foundation fill your ears with inspiration. Full programme details coming soon! French photographer Cecile Mella attended the 2009 Badilisha! Poetry X-Change and has given us permission to publish a gallery of her pictures from the week-long series of activities. Enjoy these snaps from the fest!